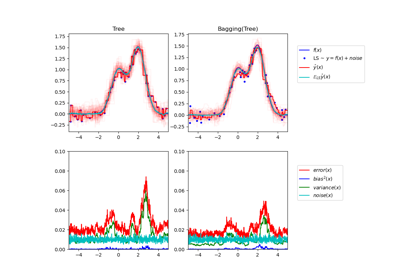 A Bagging regressor is an ensemble meta-estimator that fits base regressors each on random subsets of the original dataset and then aggregate their individual predictions (either by voting or by averaging) to form a final prediction. Such a meta-estimator can typically be used as a way to reduce the variance of a black-box estimator (e.g., a decision tree), by introducing randomization into its construction procedure and then making an ensemble out of it. This algorithm encompasses several works from the literature. When random subsets of the dataset are drawn as random subsets of the samples, then this algorithm is known as Pasting [R4d113ba76fc0-1]. If samples are drawn with replacement, then the method is known as Bagging [R4d113ba76fc0-2]. When random subsets of the dataset are drawn as random subsets of the features, then the method is known as Random Subspaces [R4d113ba76fc0-3]. Finally, when base estimators are built on subsets of both samples and features, then the method is known as Random Patches [R4d113ba76fc0-4]. The base estimator to fit on random subsets of the dataset. If None, then the base estimator is a decision tree. Whether samples are drawn with replacement. If False, sampling without replacement is performed. Whether features are drawn with replacement. Whether to use out-of-bag samples to estimate the generalization error. When set to True, reuse the solution of the previous call to fit and add more estimators to the ensemble, otherwise, just fit a whole new ensemble. See the Glossary. The subset of drawn features for each base estimator. Score of the training dataset obtained using an out-of-bag estimate. Prediction computed with out-of-bag estimate on the training set. If n_estimators is small it might be possible that a data point was never left out during the bootstrap. In this case, oob_prediction_ might contain NaN. [R4d113ba76fc0-1] L. Breiman, “Pasting small votes for classification in large databases and on-line”, Machine Learning, 36(1), 85-103, 1999. [R4d113ba76fc0-2] L. Breiman, “Bagging predictors”, Machine Learning, 24(2), 123-140, 1996. [R4d113ba76fc0-3] T. Ho, “The random subspace method for constructing decision forests”, Pattern Analysis and Machine Intelligence, 20(8), 832-844, 1998. [R4d113ba76fc0-4] G. Louppe and P. Geurts, “Ensembles on Random Patches”, Machine Learning and Knowledge Discovery in Databases, 346-361, 2012.
fit(self, X, y[, sample_weight]) Build a Bagging ensemble of estimators from the training set (X, y). The training input samples. Sparse matrices are accepted only if they are supported by the base estimator. The target values (class labels in classification, real numbers in regression). Sample weights. If None, then samples are equally weighted. Note that this is supported only if the base estimator supports sample weighting. The predicted regression target of an input sample is computed as the mean predicted regression targets of the estimators in the ensemble.